Surprisingly quick and easy to do once you know the trick, piping chocolate is a great way to send a message with your dessert. 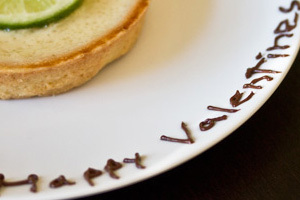 Of course, the same technique used for letters can also be used to pipe more elaborate chocolate designs if you’re feeling particularly artistic. The secret to making chocolate pipe-able is to ruin its texture on purpose: adding a tiny amount of water to cause it to “seize.” This thickens the chocolate for better control, more stability, and more height on the plate. 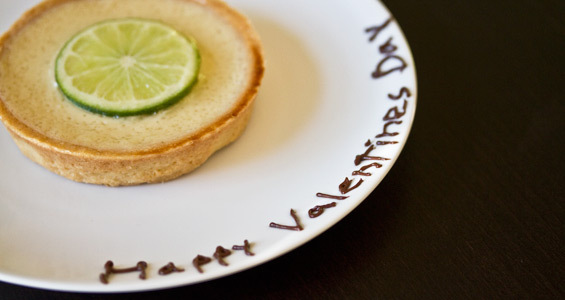 Practice definitely makes perfect when it comes to decorating the plate, so make extra chocolate your first time. 1. Set up a double boiler by placing a large metal bowl on top of a pot of water. The pot does not have to be full of water, and the bottom of the bowl should not touch the water. You’ll be using the steam’s heat to melt the chocolate. 2. Add the chocolate to the top bowl, and boil the water until the pieces melt. 3. Add a very small amount of water to seize the chocolate, depending on how much you’re making, you may only need a few drops or 1/8th tsp. 4. Load some of the seized chocolate into your paper piping bag (err on the side of under-filling). Turn the heat on the double boiler down to a simmer so that the chocolate stays melted. 5. Pipe the chocolate onto your dessert plate. We recommend doing this before adding sauce/your dessert so it’s easier to clean if you need to start part or all of your design over again. Hold the tip of the piping bag just above the plate and pipe the stream of chocolate in the air and onto the plate, dragging the dangling chocolate into the shapes of your designs, periodically letting it drift down to the surface of the plate to ‘tack it down’ every few millimeters.